This was my great extravagance of the week. It was between this and a 34 year old Port Ellen. A 37 year old Lagavulin. The 12 year old is always so reliable, that when I decided what to splash out on, this was an obvious choice. That said, it was an insane amount of money to spend on a bottle of whisky, and although it’s very, very good I wouldn’t buy a second even if I had the disposable income! I don’t suppose there are any left, anyway. The great sadness is that most people who buy one of the 1800 bottles probably won’t ever open it. What’s the point of that? If you’re going to buy a bottle – whether it’s a regular off the shelf or a special bottling, drink it (slowly, maybe – but drink it), or let someone else buy it who’s going to enjoy it as a drink, not an ornament. I opened it. It didn’t disappoint. 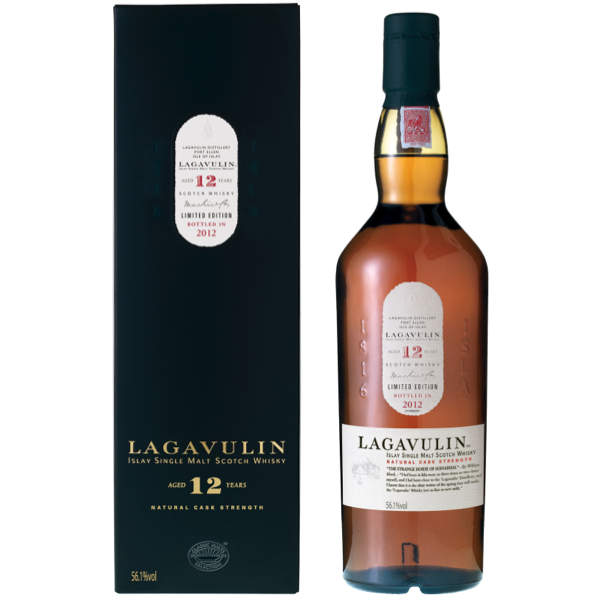 37 years old is the oldest bottling Lagavulin have ever done. The distillery isn’t usually given to aged bottlings, perhaps they found an old barrel at the back. Lucky for us. That said, it wasn’t cheap. It’s not an everyday bottle (unless you’re in a very different financial league to me!). Now I’ve bought it, it’s not so much better than the ‘everyday’ whiskies to be able to justify drinking it, apart from on special occasions. So it’s a bottle destined to be in my Monk’s Bench for years, giving up a glass or two a year. But the idea of enjoying this for the next half decade suits me just fine. I hope it’ll have equally good (and obscenely expensive) company by then. 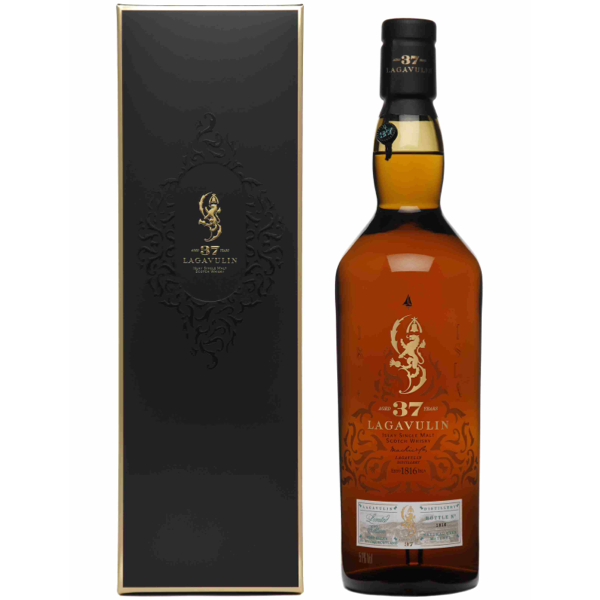 Ultimately, though, as good as this is I could have had ten bottles of the 25 year old Bunnahabhain for the same money. And – if I were buying again that’s what I’d have done. Sorry, Dad. Lagavulin was my Dad’s favourite whisky. It’s the one he most often lifted from the old Monk’s Bench when he trained me to drink whisky through my late teens and early twenties. So it’s no surprise that I inherited a love of this beautiful Islay malt. It’s consistently in my top 3, and consistently good, even at only 12 years old. I’ll state the obvious and say I prefer the 16, the 18 and the 21 year olds. Which was a big factor in choosing my most obscenely expensive whisky of the week (review coming on Friday). But if you’re a whisky drinker and you don’t have a bottle of Lagavulin in your Monk’s Bench (or whatever it is you keep your bottles in), then that’s a serious gap in your offering. It’s an Islay, so it has a lovely smokey aroma, the peaty flavour you expect, but neither assault you like the heavier tones of, for instance, a Jura. It’s eminently drinkable, you can sit washing it around in your glass as you chat, filling your head with the warm fireside, woodsmoke aroma. You can sip and let the flavour spread over your tongue and the inside of your cheeks – and just a small sip will fill your mouth with flavour. Or you can take good solid mouthfuls and swallow it down, heating your throat without any risk of pulling a whisky face (unless you’re a big girl’s blouse, of course). The best part is in the morning, when you come downstairs, clear headed and see how little is left in the bottle. That’s how easy Lagavulin is to drink – you don’t notice how much your drinking that evening, and you don’t get reminded in the morning. Buy. Never be without it. Laphroaig is, for my money, one of the top 5 single malts. Just. Of the Western Isles it’s one of the smokier whiskies, falling somewhere between Lagavulin and Jura, but not too smokey, like the latter. You can still enjoy the subtle flavours beneath the peat, which the tube helpfully tells me is nutty barley, and the sweet Islay streams. Best enjoyed by a large inglenook fire to warm yourself after a stroll in the winter snow, do not – as the distillery suggest – mix it with water. A little ice if you must. The strong comforting flavour will warm you quite effectively. That same flavour would make this dreadful in a hot toddy, completely overpowering the lemon and honey. It would be utterly spoilt by the angostura in a well prepared Old Fashioned. These are the highly subjective and unscientific measures by which I shall, henceforth, review whisky (no pun intended). This might seem a low score, but I’m a harsh judge of whisky. Only 3 or 4 score higher. Few score double figures.